Topplebush.com: Our Bush store features all kinds of interesting and clever progressive themed products. 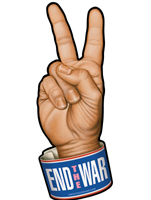 We are currently only offering these three different Peace Magz for sale on this page. These Peace Magz will unfortunately never become obsolete. All of our other anti-Bush gag gifts and other progressive-themed items that were once sold on this page are now on sale at close-out pricing. The Peace Magz are shipped for FREE by First Class or Priority Mail within the U.S. only. To view our product guarantees and return policy, please visit about us. Here's how to order by personal check or M.O. 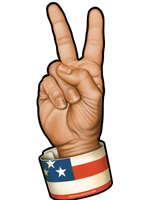 This is a new and clever take on the old peace sign that can be used on your car, at work, or at home. Pictured from left to right: Bring 'Em Home, End the War, and Flag. When you add one of these magnets to your cart, you will be given style options. Description: This magnet is approximately 7" high by 3" wide. Each magnet sells sealed in its own attractive packaging making it easy to give as a gift. Price for each magnet is $4.95 with FREE shipping and handling. Use the button below to order one magnet. For three magnets, the price is $12.00 plus shipping and handling. 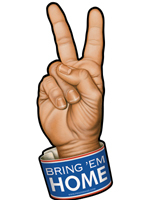 Please use the button below to order three magnets. If you want to order different styles when ordering three magnets, please indicate which ones you want in the box marked "Special Instructions" during checkout. Please contact us to order any of these items in quantities larger than those given to receive further price discounts.